Two weeks ago I met with Wendy Steinberg and she demonstrated a new App (application) that is now available for Alzheimer's caregivers or anyone caring for a person living with dementia. The application is called Balance: for Alzheimer's Caregivers, and can be purchased for $3.99 at iTunes - go here to get it. When Wendy demonstrated the App to me I immediately noticed many features that could have benefited me while I was caring for Dotty. In fact, I have several notebooks filled with information that I could have stored in this App. Amazingly, the $3.99 price is less that I paid for the spiral notebooks I used to store our information. I actually thought, I wish I had all that information stored online so I could use it more effectively now. Balance goes way beyond the ability to store information. Some of the best features allow for communication among multiple parties, keeping track of medications, and keeping everyone informed in both good and bad times. How powerful is the App? If I had the App while caring for Dotty, I could have checked and made sure Dotty was receiving her medications properly while I was away. No need to call and remind someone, just check the App first. This feature could also be subtitled - peace of mind. I really like the communication features of the App. In fact, there are a long list of ways you could use this App to your benefit. Learning: Everything you need to know about living with Alzheimer’s – from getting diagnosed to learning about the stages of the disease to understanding how to effectively care for someone with Alzheimer’s. Caregiving: Get helpful tips and information about daily caregiving – from bathing and hygiene to dressing to handling agitation. Pill Box: Manage daily medications by inputting medication names, dosing schedule, and refill dates and getting notifications on when to provide medicine to your loved one. Schedule: Effectively manage your loved one’s schedule – share calendars with other caregivers’ calendars. Doctor Diary: Track changes in mood, activity, memory and other behaviors and share directly with your doctor in real time. No more waiting for your next doctor’s visit to share essential updates. News: Read the latest news and information about Alzheimer’s to keep up with research, treatments and other developments. Family: Connect with other family members for sharing calendars and working together to provide complete care for your loved one. About: Learn about NAC and the Hebrew Home at Riverdale. NAC Store: Find the latest books, medical devices, vitamins and other essential Alzheimer’s products and services. 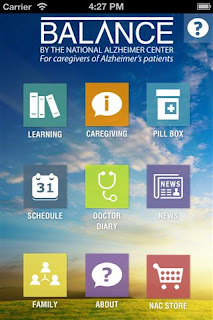 Balance was created by National Alzheimer Center Inc., a division Hebrew Home at Riverdale.